IBERIA HAD QUITE A TIME GETTING ITS FIRST SCHOOL BUILT.........In 1870, Iberia was a small village (platted in 1859 and filed for record in 1860). There were less than 100 persons in the new town but it had quite a number of business places established including 3 general stores, a blacksmith shop, a dram shop, doctor's office, a lawyer, a boot and shoemaker and a saloon....but no school. During the early 1870's several country schools were established in Richwoods Township including Mace, Allen, Madden, Fairview/Elliott, Alder Springs (once called Snufflelut), Brays, Rabbit Head, Cross, Berry, Hickory Point, Spearman, Atwell, Johnston, Curry, and there was a school for the black children that was located about 1 ½ miles west of Iberia. Allen School was Iberia's only school for many years and it was located about 1 mile east of the town on the old Iberia-Big Piney road. In 1880, Iberia had grown in size with an increase in population. There were several general/mercantile stores, a blacksmith shop, a harness shop, a mill, 3 doctors, 1 dentist, an apothecary/dram shop, a hotel, a livery stable, wagon and implement dealer, a barber, 3 lawyers, a furniture maker, 3 stonemasons, a couple of millinery shops, a newspaper, 4 fraternal organizations (The Masons, I.O.O.F., G.A.R., and Sons of Veterans) and a saloon.........BUT STILL NO SCHOOL. In 1883, the people of Iberia decided perhaps they needed a school in the town and after four years of talking about it, they formed a stock company in 1887, which eventually built a two-story brick building, at the cost of $5,000, to serve as a new school. It was called the Iberia Normal School and enrolled a number of students. The school was built for the sole purpose to graduate students who wanted to become teachers. The building was not completed when it opened its doors. There was a mortgage against the school in the amount of $1,000 and it was put up for sale. Some folks came along who decided they might be interested in buying the school and they would use it as a livery stable....Imagine that! A new, two-story building (described as a beautiful addition to the town of Iberia) was to be used as a home for horses and mules! It was about this same time, circa 1890, that a young man and his new bride, Professor G. Byron and Mabel Smith, heard of this empty school. They had recently graduated from Knox College, located in northern Illinois, and with the help of the Congregational Churches of the St. Louis area, were able to make a train trip to central Missouri. The train brought them to Crocker, in neighboring Pulaski County, and they arrived in Iberia by way of a horse and buggy. The Smiths wanted so much to start a school for the children of the hill people of the northern Ozarks and Iberia certainly fit that category. They learned that the country children of Iberia were so hungry for an education and they eventually were able to make Iberia Academy a reality. The original building of Old Iberia Academy (built as a Normal School in 1887) burned and was destroyed by a fire in October 1917. Another school building was constructed on the same site and is still in existence today, but has not used as an educational facility since 1952. I am not sure when the first grammar school was built in Iberia but it must have been in the early 1890s. It was described as a two-story frame building with winding stairs and a double door on the front. It was used less than 20 years and was then sold at auction...WHY DID THEY KEEP TRYING TO SELL IBERIA'S SCHOOLS ? ? Front, L-R: Ruth Clark, Irene Ferguson, Eva Alexander, Ethel Ferguson, Opal Durham Paulson, Catherin Brown, Carol Thompson Frye. Second row: Edna Jones, Edna Heltzell Davison, Ona Loveall, Mae Carroll, Dorothy Osborn Barry, Mae Mace Perkins, Pansy Dupree. The people of Iberia voted for a new school so it was built in the summer of 1913. The school had 4 classrooms and was located to the back of the old Lombar mansion (where the Bank of Iberia is located today). 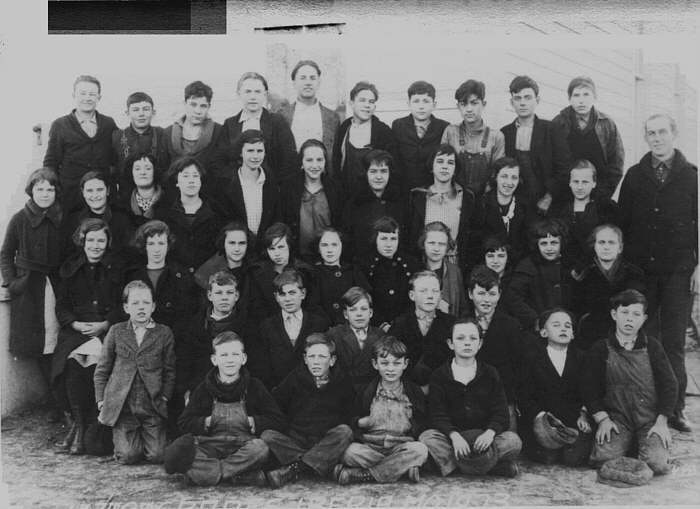 On April 24, 1923, the school was destroyed by fire. School reopened in September 1923 with classes held at the Congregational Church and the G.A.R. Hall. The teacher standing at the right side is Fred Ambrose. Top row L-R: Jewell Morrow, Carl Mace, Ward Ferguson, Herbert Martin, Albert Perkins, Audrey Ferguson, Clarence Farnham, George Gardner, Floyd Atwill, Stanley Tallman. Fourth: Virgie Clark, Fern Meredith, Velma Robertson, Lucy Pickering, Orma Woolsey, Gladys Wall, Lucille Ferguson, Sydney Dickerson Bernice Dickerson. Third: Hazel Morrow, Faye Abbet, Vera Farnham, Hazel Mace, Veta Eads, Gladys Hensley, Dorcas Louise Ferguson, Dorothy Mace, Reba Dickerson, Goldie Wilson. Second: Ellsworth Groff, George Capps, Arnie Burks, John Groff, William Hughes, Ransom Scott, Earl Farnham, Archid Hammack. Front: Willard Slawson, Edward Slawson, Dorsey Arnold, Claud Arnold. 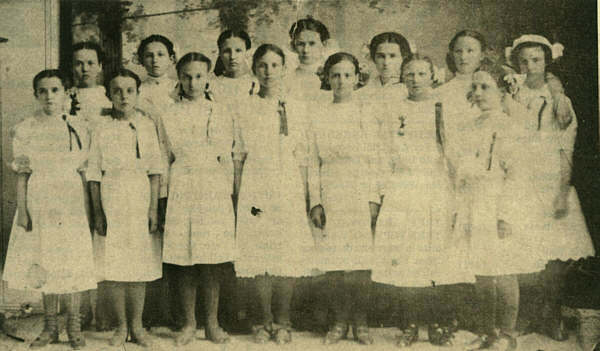 Iberia's first high school was built during the days of the W.P.A. (Work Projects Administration), a government work program that provided many jobs for families across America from 1935-1943. The W.P.A. constructed many buildings, bridges, roads, and airport improvements during those days of the Great Depression, including Iberia High School. Iberia's first high school was voted into existence in 1937 with a bond issue. It took 3 years to build it and while the school was under construction, classes were held in the grade school basement. The first Graduation Commencement was held in the new high school in 1941. During the 1940s and 50s, Iberia had an elementary school and a high school, but bad luck once again slipped into town and the high school was destroyed by fire in 1959 (only 18 years after it had been built). 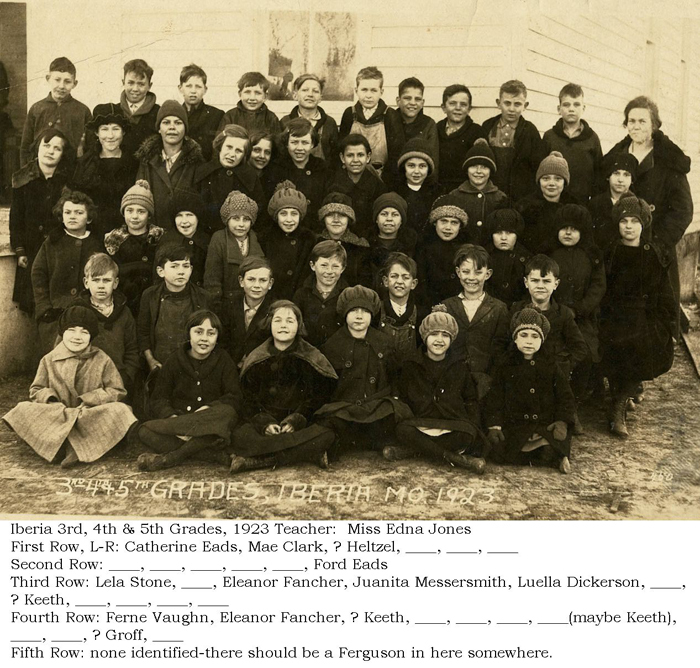 It is difficult to believe that Iberia had so much bad luck trying to keep a school in existence over all those years.......The Iberia school system was the last in Miller County to consolidate. After the high school burned in 1959, it was decided that all the country schools in Richwoods Township would be brought into consolidation and the students were bussed into Iberia when the new school was built. So, I can only wish Iberia R-V schools the best luck ever in the upcoming years...... If the schools of Iberia have survived being ignored for decades during their birthing years; abandoned and sold when they were felt to not be "financially sound"; and then burned to the ground on three different occasions, I believe they can withstand anything that might come their way in the future.